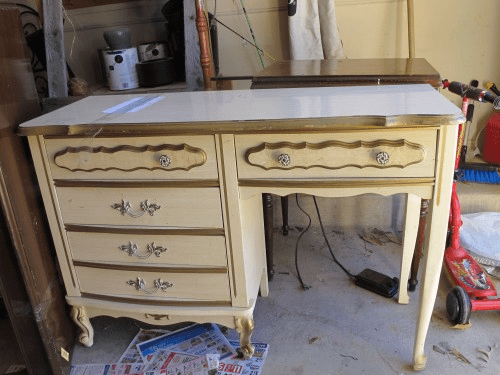 You are here: Home / Furniture Makeovers / Tables & Desks / I Bought This French Provincial Vanity For Under $10! 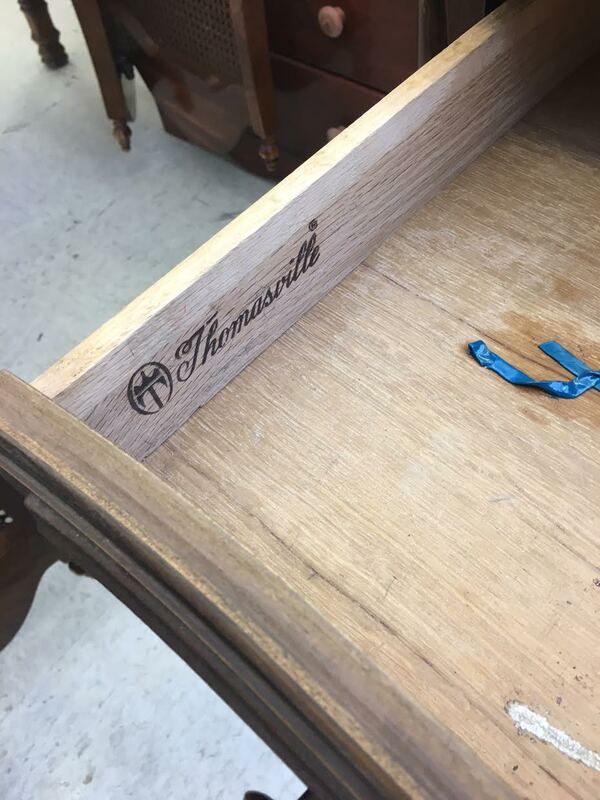 It’s hard to believe that one can go to the thrift store and buy a Thomasville French Provincial vanity for $9.67. Seriously, how can that be?? 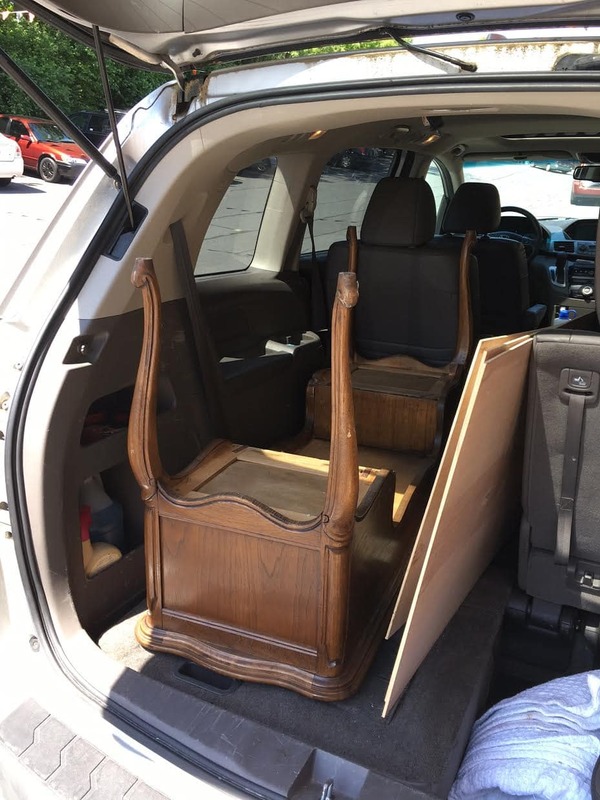 Surely my favorite thrift stores of the Washington, D.C. suburbs of Maryland don’t realize what they’re practically giving away quality stuff for free! You see, last Wednesday I stumbled into Value Village. And who do I happen to run into there? You guessed it: Thrift Store Pete. This man hits every thrift store in the area every morning, but the odds of running into him at this particular thrift store so early in the morning was rare. (If you don’t know about Thrift Store Pete, you can read about him HERE and HERE). Pete gets the UTD award (yep, I’m going to go ahead and coin the term “Ultimate Thrift Diver” because this man is a beast!). It was in good condition, with some scratches on top. 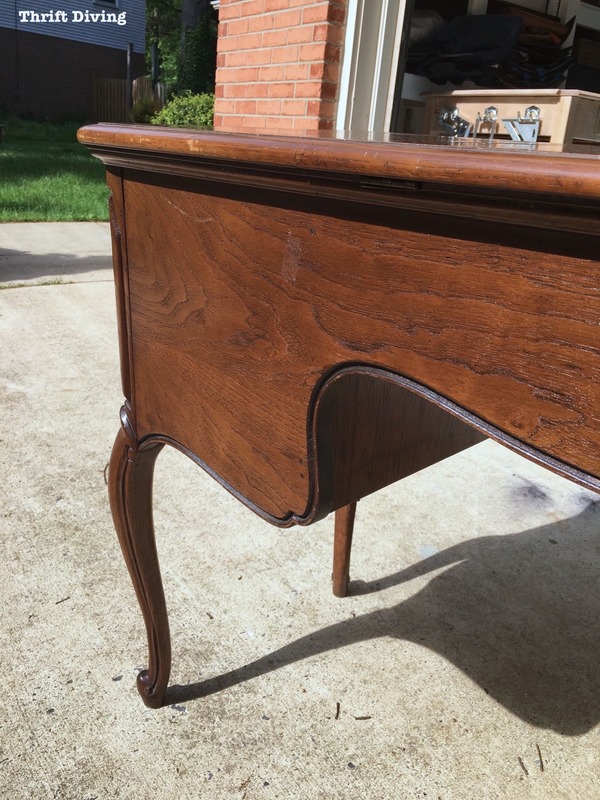 And part of the decorative molding on the bottom right-hand side of the drawer had broken off. But this furniture was heavy. I wouldn’t call this sneaky. So, of course, I kept urging Pete, “Come on…you should buy this!” It was too special of a piece to simply walk away. Yet Pete and I are both fighting space issues (you know you are, too, when you’re a thrift diver!). 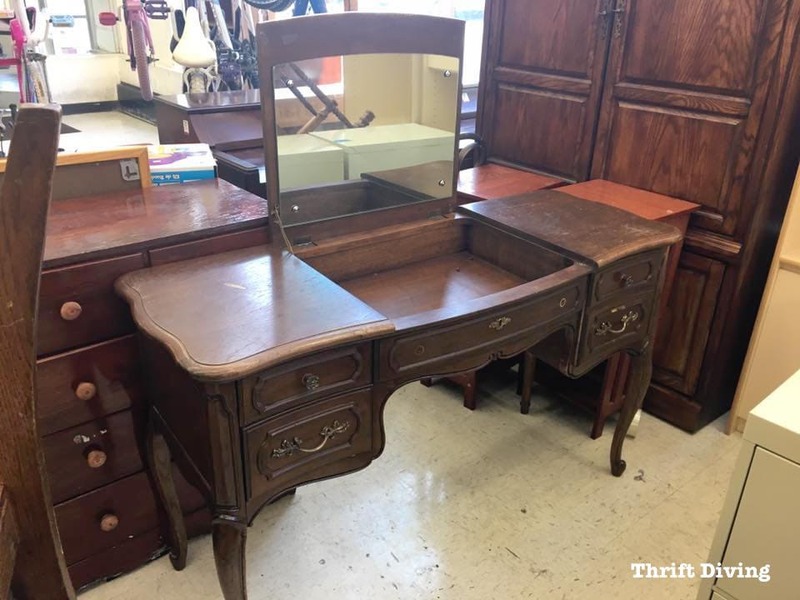 We ogled over the vanity and wondered how much it was since there was no price tag. Curiosity got the better of us. We had to at least ask, right? And that’s how this beauty came home with me, space or no space in my garage! 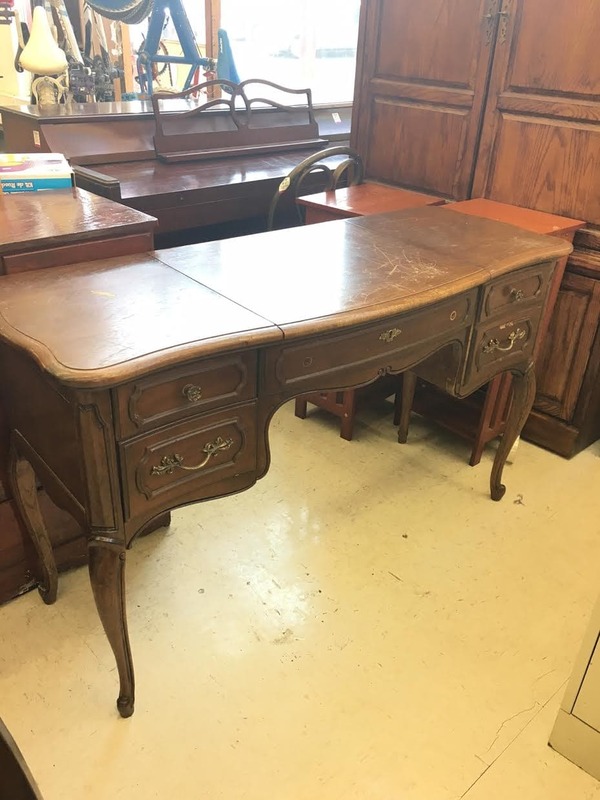 Solid Wood French Provincial Vanity! 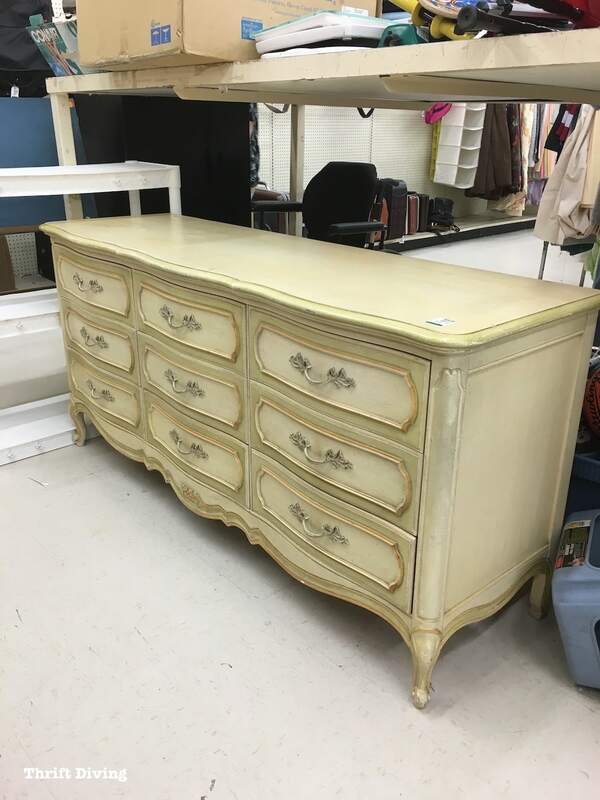 Most of the French Provincial style of furniture I’ve seen at the thrift store have all been ones that look yellowish with gold trim. 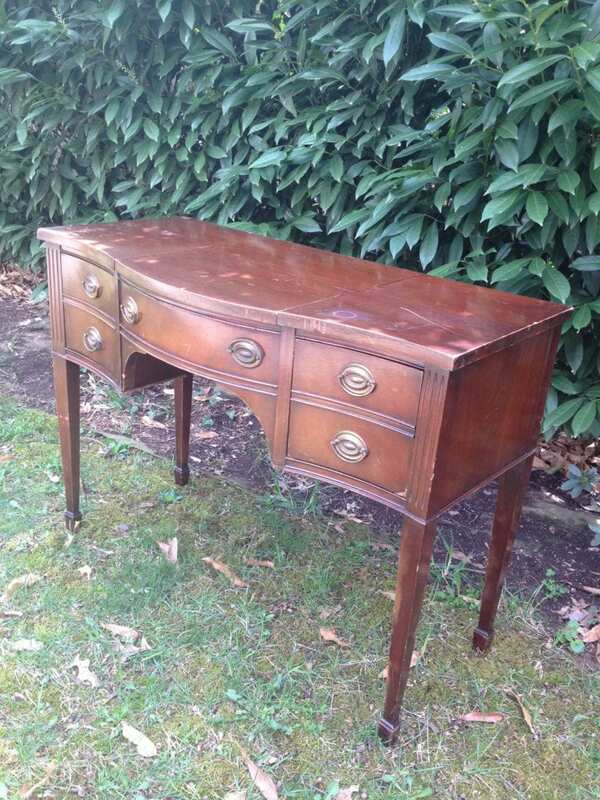 My first thought, whenever I have seen French Provincial furniture like this, is to simply paint it. 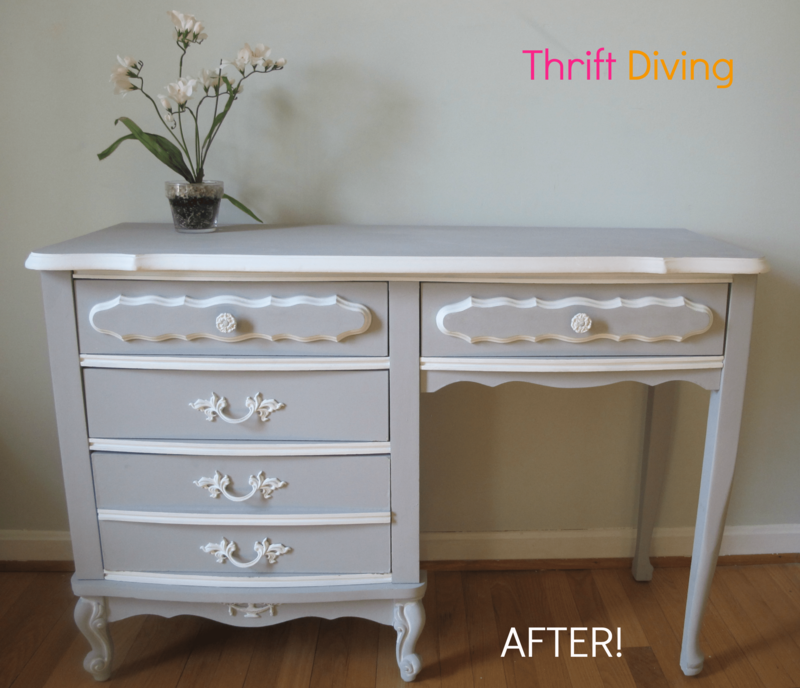 But with this vanity, my first thought was to strip the top and paint the body, like I did with this vintage vanity makeover several years ago. The wood on top was so rich and gorgeous, which looked perfect next to the original gold-colored pulls and Annie Sloan Scandinavian Pink chalk paint. 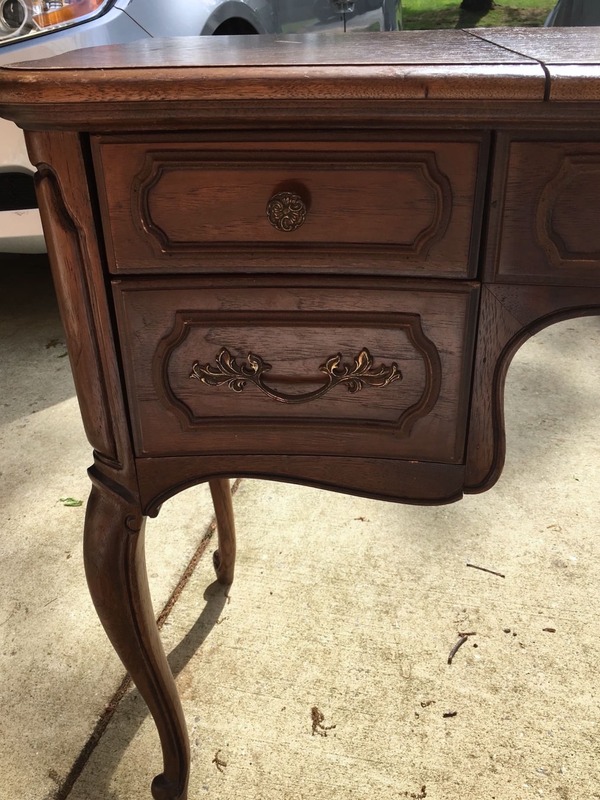 How Would YOU Refinish This French Provincial Vanity?? 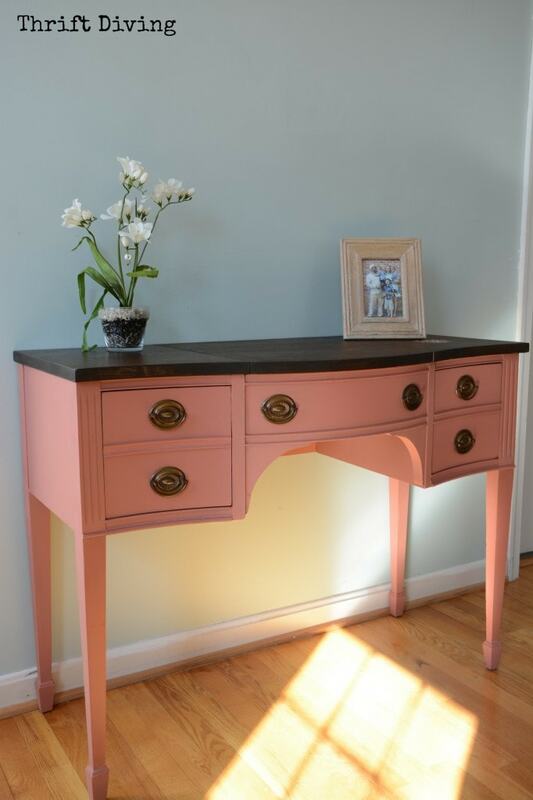 The reason I’m so unsure of how I’d like to refinish this vanity is because it really is such gorgeous, solid wood. Wood is a magical thing. Not to mention the cost of it… The look of it… The way its grain creates interesting patterns… And can we just give furniture makers a shout-out for creating amazing pieces that last a lifetime?? Furniture this good doesn’t just come off of a conveyor belt, folks. HA! To cover it up with paint, at times, seems like a travesty. Notice the pretty groove that sits at the bottom of the back? Yet, I can totally see this being quite beautiful with a soft baby pink body and stained top. 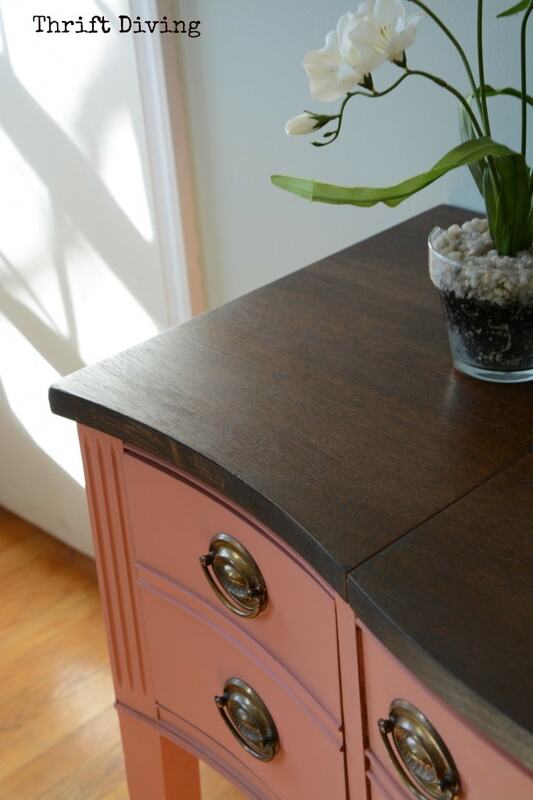 Baby pink with gold knobs and pulls! I’ve thought about just cleaning up the body since it’s in great condition. It’s missing a couple knobs in the center, so I will likely have to replace those. But I love the French Provincial handles! This is a quality piece of furniture, indeed. I took my knuckles and knocked on the back, and I’m telling you, that’s solid oak! But the top is in bad shape. It really needs a good sand-down and refinishing. The scratches should come right out. I love the idea of just refinishing the top and leaving the body alone, but I don’t have enough confidence in my strip-and-match skills! So as it stands right now, this piece is in my garage, waiting for me to decide how to refinish it. And you’re probably wondering what I’d do with it, right? Well, considering I don’t have any place in my house for it, it will likely get listed on Craigslist or Facebook to sell! I had promised one of my audience members during a home show recently that I would test out the market by trying to sell on Facebook, so that’s likely what I’ll do. 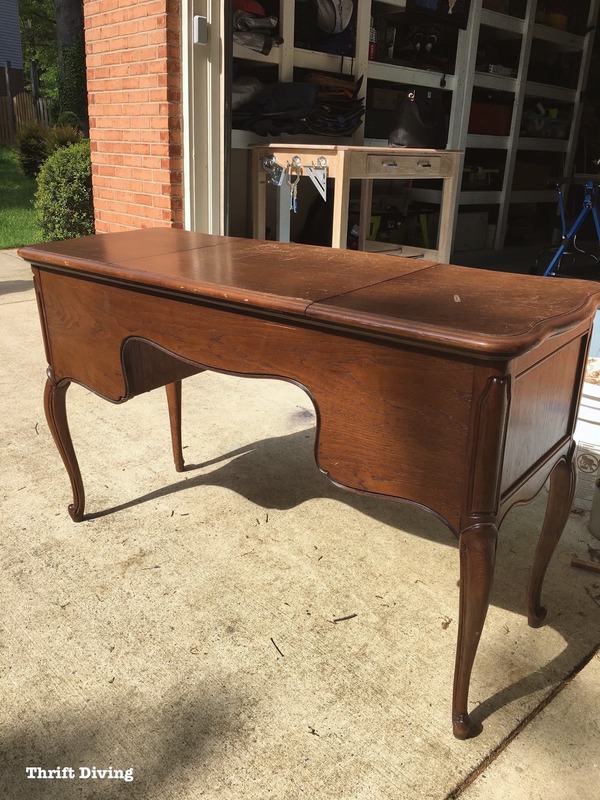 Given all that you know now, how would you refinish this awesome French Provincial vanity? Hi! Have you sold this yet? This is exactly what I’m looking for. I would stain and refinish. It is a quality piece. If the top is beyond salvage, decoupage a nice complimentary fabric on it. Don’t paint! Strip and stain it! This will be more valuable and beautiful! Light and dark, maybe an espresso on top would be nice with a lighter bottom. What a great find! Depends on how valuable this particular piece is! 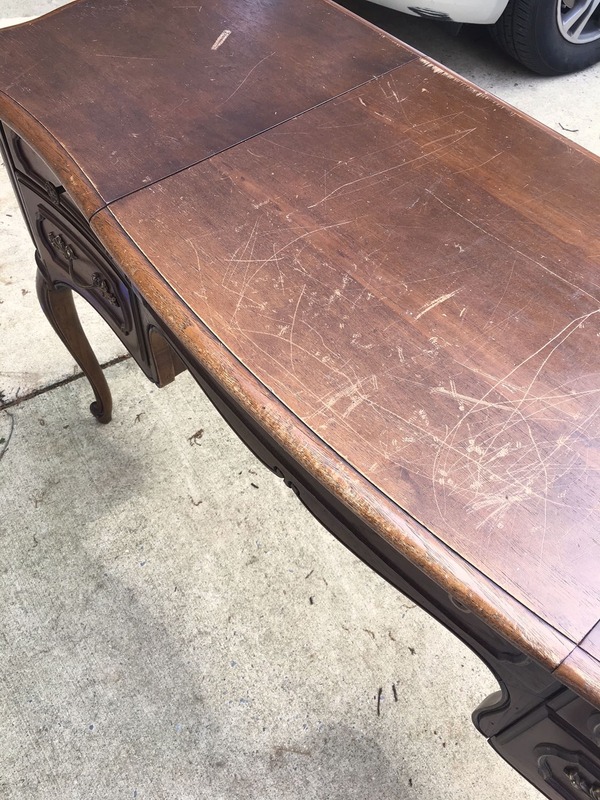 If it’s valuable, just try to refinish it as close to the original as possible. If it’s not valuable (mainly to someone like a collector), do it however you want. 😉 Grey is always a popular color to sell! Antique white is another contender. Since I’m not into sanding,staining,or that kind of stuff that takes forever.i say painting is the quickest and fastest way to market. Would not even dream of painting this beauty! Strip down and stain. It’s gorgeous and what a steal! Love it. Can’t wait to see what you do with it.